Got extra pumpkins you need to get cracking on in the kitchen? I know, it’s hardly a dilemma. Pumpkin pie, pumpkin bread, pumpkin shakes, pumpkin soup, pumpkin cookies…oh! Let’s not forget pancakes, waffles, overnight casseroles, and the delectable endlessness of etc…! Just roast and puree those jack-o-lantern innards and freeze till desired. This year, Halloween began in earnest inside the house at the end of August. (We kept it under wraps indoors for awhile because some of us—not Chef F—were a little embarrassed.) 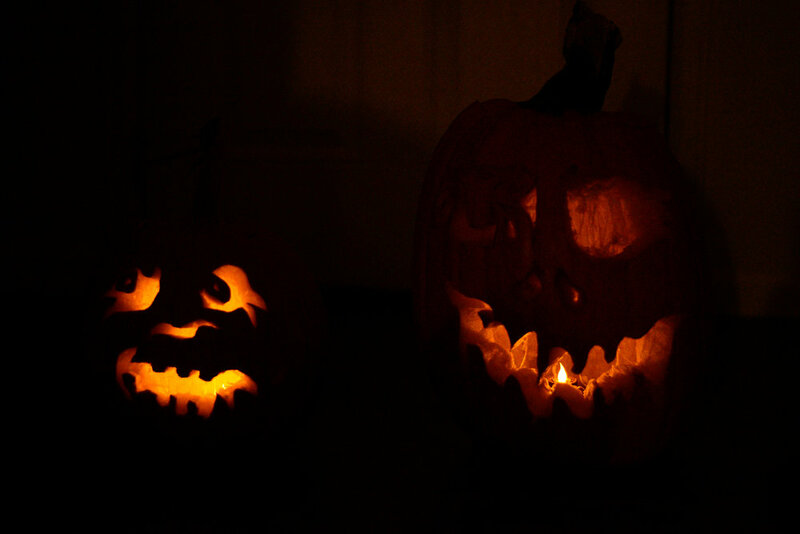 By Halloween, we had already composted many a curcubit cousin and had accumulated an eye-catching collection of both molding and fresh pumpkins cramming our small front step. We had big, medium, small, and mini pumpkins. We had blue, green, and ghost pumpkins. We had smooth pumpkins, bumpy pumpkins, volcano-pumpkins, geoboard pumpkins, and secret passageway pumpkins. Yeah. That’s a lot of pumpkins. And yay! That’s a lot of roasted pumpkin seeds and puree to play with! If your endless scrumptious line-up could use some refreshment, don’t forget to give a nod to savory options here and there. Pumpkin pasta sauce, for example. Not the creamy wanna-be mac & cheese goodness I know we all love—actually, YES that creamy goodness, but also YES to this less sweet variation. It’s similarly replete with creamy goodness, but easier to load up with whatever veggies you’ve got in the fridge. It makes a great pizza sauce as well, perfectly smooth and not too runny. And, any further leftovers can be thrown into pumpkin chili. Speaking of pumpkin in chili—I’m revising the standard at our house to always include at least double the pumpkin it used to. In the past, I’ve only thrown in about 1/2 cup or so of pureed pumpkin. Now that we’ve enjoyed this Halloween aftermath sauce, I’m boosting that amount to 1 to 2 cups. The pumpkin packs in a certain robust flavor, along with all that betacarotene power and more. I know it’s got to be good, because not only do I like it, but Chef F licked and licked the tasting spoon with wide-eyed exclamations. I remember being a kid and getting the shock of my life while peeking into the oven once. There was my cheerful, beloved, beautifully round pumpkin, his once smiley face drooping into contorted grimace while he was being cooked. Fortunately, Chef F is all on board with cooking the pumpkins. He gets it. After all, he grew the pumpkins, he tended and loved the pumpkins, and he shared Halloween with the pumpkins. Now he’s all about gutting them, roasting the seeds, and whipping them up into pie. But he’s eagerly saving the seeds, for next planting season. On a baking sheet, place tomatoes, onion and garlic, coating liberally with cooking spray. Roast for approximately 20 minutes, stirring midway, until onion is browning and tomatoes are beginning to soften and burst out of their skins. In a saucepan, combine, pumpkin, crushed tomatoes, broth or water,and seasonings. Cook over medium heat for approximately 15 minutes. Stir in almond milk then puree with an immersion blender or in batches in a blender. Add water to thin as needed for desired consistency. Season with salt and pepper to taste.